Aromas from essential oils diffused in steam rooms have become a powerful wellness option. Here’s why. One of the most famous passages in literature is the “madeleine” moment in Marcel Proust’s “In Search of Lost Time.” When the novel’s narrator dips a madeleine, a small French pastry, into tea, the aroma creates an involuntary response that conjures a flood of memories. The madeleine moment is a cultural touchstone for a simple reason: Everyone can relate to it. We have all been moved by a familiar scent from our past that creates an immediate and powerful sensation. But distinct aromas can do more than act as memory triggers. Scientific research on olfactory responses to outside stimuli has found that many aromas, especially from botanical sources, can have significant physiological effects. You may know this as the science of aromatherapy. Sometimes known as “essential oil therapy,” aromatherapy utilizes different aromatic extracts from botanicals to produce beneficial health outcomes in men and women of all ages. Over the last few years, the practice of aromatherapy has taken on a larger role in holistic health and wellness disciplines. 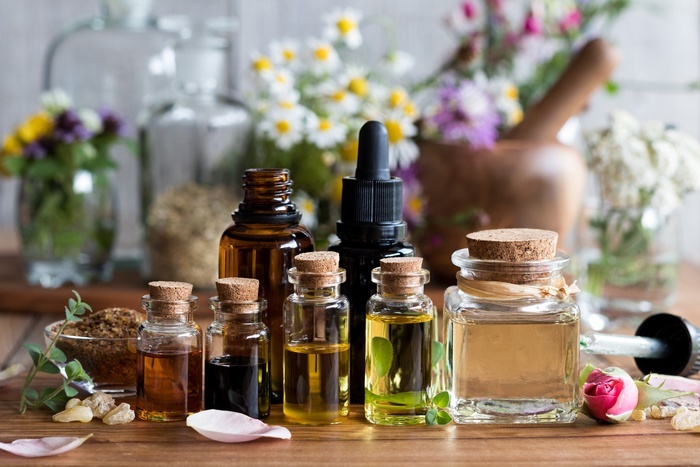 Like other treatments commonly known as complementary medicine, aromatherapy is an ancient practice that is gaining credence with mainstream healthcare institutions that once dismissed its efficacy. According to the Mayo Clinic, clinical research supports a link between aromatherapy and pain relief, elevated mood, stress reduction, and improved quality of life for those with chronic health conditions. One reason aromatherapy’s reputation has improved among research institutions like the Mayo Clinic is the further refinement of the quality of essential oil extracts, along with more efficient delivery systems. Leading the way in the application of essential oils is steam rooms. Using special infusers in steam rooms to administer botanical extracts is emerging as one of the most effective ways to experience the proven benefits of aromatherapy. It’s easy to see why these benefits would be enhanced in a steam room environment. Steam therapy by itself has been shown to improve many of the same biomarkers that aromatherapy positively affects. Combining the two bolsters the potential physiological effects of each, particularly in the areas of stress reduction and respiratory function. The use of essential oils has been practiced by far-flung societies around the world for centuries, most notably in Chinese medicine and Indian Ayurvedic practices. But the Roman, Egyptians, and Greeks also used essential oils, and even Hippocrates, the father of modern medicine, administered them in treatments. Aromatic essences have been a key ingredient in perfumes over the centuries, but it’s their protective and healing properties that have earned a wider following in Western cultures both high and low. French grave robbers in the 15th century used “thieves oil,” a blend of clove, rosemary, and other botanicals, to protect themselves from disease while stealing from the dead and dying. (And, yes, you can still buy it.) While that’s not the most inspirational use of essential oils, it certainly speaks to their power. You need to keep a few things in mind when enjoying a session in a steam room infused with essential oils. Here are some do’s, don’t, and musts you should know. Do know your oils! Different aromas have different effects on mood, physiology, and even emotions, according to multiple research studies. Choose the one that fits your wellness goal. For instance, lavender has been found to kill certain types of fungi and bacteria. It’s also been known to help reduce anxiety, relieve pain, and work as an antioxidant to boost anti-aging therapies. Eucalyptus oil, on the other hand, is utilized to fight seasonal allergies, relieve respiratory problems, clear sinuses, and help relieve muscle pains. Do try proprietary blends! Some chemists and alternative medicine practitioners have developed ingenious proprietary blends that are designed to create a more targeted outcome. MrSteam has an assortment of these creative formulas called Chakra Oils for use with their AromaSteam system. These include, among others, Red Vitality, which helps improve energy, and Yellow Awakening, an aroma that’s designed to support enhanced cognitive function, and help improve memory and concentration. Check out the entire list of Chakra Oils here. Don’t apply essential oils directly to your skin. For instance, steam-distilled clove may irritate your skin if applied directly, so make sure it’s vaporized through a carefully calibrated unit like the MrSteam AromaSteam system. Don’t DIY your steam shower infusion system. Not a good idea. You don’t want to waste oil or use too little of it by administering the oil incorrectly. Again, use a system that’s designed for the task by dedicated professionals. Don’t stay too long in a steam room, essential oils or not. Aromatherapy in a steam room setting can be so relaxing and invigorating that you may be tempted to overdo your steam time. If you’re new to steaming, start out staying between 10-15 minutes, but even veteran steamers should limit their sessions to 20 minutes at a time. You must try aromatherapy with other augmented experiences. You can enhance the therapeutic effects of essential oils by combining it with music therapy or chromatherapy. Calibration of atmospheric lighting and the calming presence of music can create a sensory experience that can be transformative. You have to experience it to believe it. For more on MrSteam’s options in music and lighting, visit their resource pages for MusicTherapy and ChromaTherapy. You must have a steam room in your residence to get the most out of essential oils. A commercial or public steam room is not going to offer the benefits of aromatherapy, and if by some chance a public steam facility does include essential oils, don’t count on it being as effective. Many people are learning, steam rooms offer much more than a lot of hot air. It’s a comprehensive wellness experience that can have multiple mental and physical benefits. Features like aromatherapy only heighten their value. And steam rooms are more affordable and accessible than ever before. Once you can get used to a daily dose of steam therapy combined with aromatherapy, you won’t believe you ever lived without it.